« DISTRICT 8 PRESENTS FAMILY GAME SHOW NIGHT!! 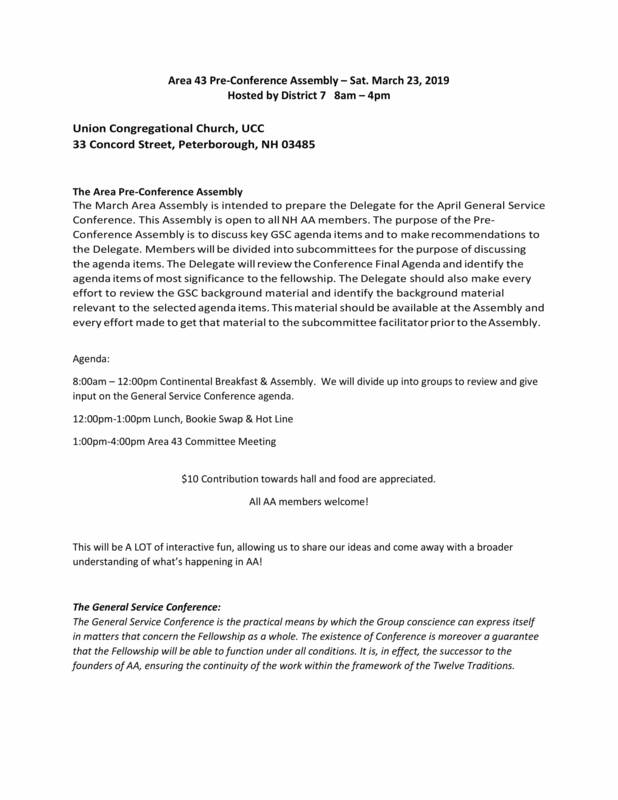 The March Area Assembly is intended to prepare the Delegate for the April General Service Conference. This Assembly is open to all NH AA members. The purpose of the Pre- Conference Assembly is to discuss key GSC agenda items and to make recommendations to the Delegate. Members will be divided into subcommittees for the purpose of discussing the agenda items. The Delegate will review the Conference Final Agenda and identify the agenda items of most significance to the fellowship. The Delegate should also make every effort to review the GSC background material and identify the background material relevant to the selected agenda items. This material should be available at the Assembly and every effort made to get that material to the subcommittee facilitator prior to the Assembly. 8:00am – 12:00pm Continental Breakfast & Assembly. We will divide up into groups to review and give input on the General Service Conference agenda. $10 Contribution towards hall and food are appreciated. All AA members welcome! This will be A LOT of interactive fun, allowing us to share our ideas and come away with a broader understanding of what’s happening in AA!